Pandit Habib Khan is regarded as one of the best sitar players in the country today. He was born into a family of musicians and can trace his lineage back several generations to when classical music enjoyed the patronage of the nobility and royalty of India. He began his training at the tender age of five under the strict eye of his accomplished father, Ustad Hameed Jaffer Khan. The Jaffer Khan family was from Indore and were well known for their unique style of playing the sitar, melding the effect of the human voice and the instrumental tone into a harmonious whole. Habib Khan has carved out a distinct style of his own which is a blend of his father's traditional techniques and his own imaginative inventions. 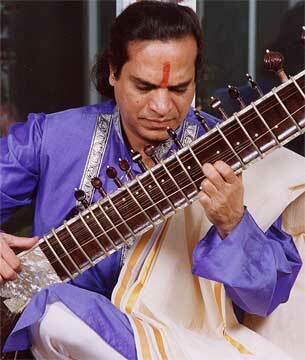 He is as much at ease with light classical and religious music as he is with pure classical renderings of ragas. Formerly addressed as Ustad, a title of honor for a master Muslim male musician, Habib Khan took the extremely unusual step of accepting the title of Pandit , a similar honor for a master Hindu male musician, in a special ceremony in India. Pandit Habib Khan, whose wife is Hindu, desired to make the point that all religions should respect each other. Habib Khan lives and teaches in the San Francisco Bay Area and is actively involved with Om Music Circle, an organization formed to promote the music of North India. He performs many classical Indian music concerts, with the Habib Khan Indian Jazz Ensemble, and even in a classical Indian jugalbandi with the unusual distinction that it is between sitar and guitar! He has composed music for several CDs and for a yoga video series by Vasanti Bhat. His own CDs include Zeeshan, Colors of Sound with tabla maestro Swapan Chaudhuri, and The Longing and Ecstasy: a two CD project with scalloped fretboard guitar master Matthew Montfort of Ancient Future, tabla master Swapan Chaudhuri, famous jazz drummer Danny Gottlieb, Persian santur master Alan Kushan, saxophonist extraordinair George Brooks, Windham Hill/Narada pianist Ira Stein, Russian vocal diva Irina Mikhailova, and others. The Longing shows its roots in the music of India with strong compositions by Habib Khan. Ecstasy showcases the jazzy, improvisational side of Habib Khan's music. Pandit Habib Khan and Mattthew Montfort perform a Guitar-Sitar Jugalbandi with Arshad Syed. Socha Socha (Khan/Montfort. 10:34). iTunes. >YTmusic. Indian raga with full instrumentation. Hifi example is an excerpt from the introductory alap. Full download features the whole lush composition with full band. From Planet Passion. (Ancient-Future.Com AF-2001). CD/Gift Card, $17.98: Add 1 to Cart. Buy 1 Now. To reach Pandit Habib Khan, contact: info@ancient-future.com.